As you can see, it has the same notes as C melodic minor but it’s viewed as a G scale, rather than a Cm scale. Consequently, when thinking in terms of C melodic minor, the notes that make up a Cm triad are the strongest within the scale (C, Eb and G). Whereas; when the same scale is seen as G Mixolydian b6, the notes of a G major triad are considered to be the strongest (G, B and D). This change in perspective should force you into interpreting the same body of notes in a slightly different way. Please do not forget to check our guitar dictionary to find answers and music explanations. Lydian sharp five is also known as Lydian augmented. Furthermore, because it’s the third mode of the melodic minor (which is also known as jazz minor) it is also sometimes referred to as jazz minor three (or JM3). This lesson I’ve given you five scale patterns for Eb Lydian sharp five, each containing an Eb maj7#5 chord form as a framework on which to build the scale. I’ve also given you the same shapes again, each using an Eb maj7#5 arpeggio as a framework. Remember, as I pointed previously (in Mixolydian Flat 6) , these patterns are meant to act as visual aids rather than practical ones -so don’t worry if you find something awkward to finger. It’s important that you have a clear cut set of visual reference points in place to guide you when soloing. Once you have learned to recognise these chord-based shapes you’ll find that you can start to re-finger things without getting lost. As you may have noticed, I have deliberately started to adopt a particular format for each of these articles devoted to the melodic minor modes so that you can easily get into a familiar routine – a routine which you can adopt and subsequently apply to any scale. Below, I’ve listed just some of the possible sounds that exist within Eb Lydian sharp Five that you should try. As usual, I suggest that you take some neck diagrams and plot out the shape of each device within all of the various scale shapes. This lesson’s progression comprises chords that are diatonic to C melodic minor that resolve to an Eb augmented chord. 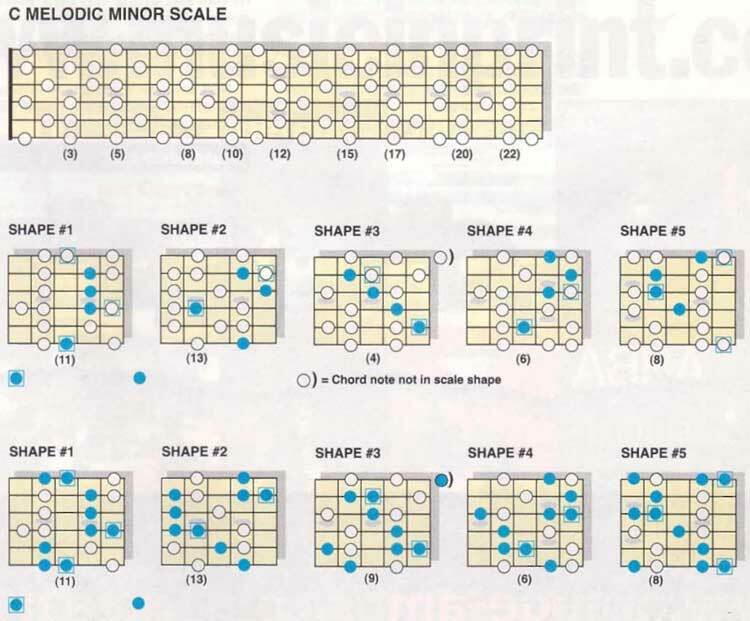 Eb Lydian sharp five provides us with an ideal perspective: it enables us to see the notes of C melodic minor as an Eb scale -where the notes of an Eb augmented triad are the strongest notes within the scale. It’s a full lesson of Lydian Sharp 5 Scale. © 2012 - 2019 TabsClub Powered by TabsClub 42 queries in 0.322 seconds.